The story we’re hearing today requires us to go back to the beginning of the Universe and explore briefly its rich yet mysterious history. The Big Bang marks the creation of the Universe 13.8 billion years ago. Seconds after the Big Bang, fundamental particles came into existence. They smashed together to form protons and neutrons, which collided to form the nuclei of hydrogen, helium, and lithium. Electrons, at this time, were wheezing by at such high velocities to be captured by their surrounding atomic nuclei. The Universe was ionized and there were no stable atoms. After 300,000 or so years later, the Universe had cooled down a little bit. The electrons weren’t moving as fast as before and could be captured by atomic nuclei to form neutral atoms. This ushered in the era of recombination and propelled the Universe toward a neutral state. Structure formation happened next, where some of the first structures to form are thought to have been quasars (actively accreting supermassive black holes), massive galaxies, and the first generation of stars (population III stars). The intense radiation from incipient quasars and stars started to ionize the neutral hydrogen in their surroundings, beckoning the second milestone of the Universe known as the epoch of reionization (EoR). Recent cosmological studies suggested that the reionization epoch began no later than redshift (z) ~ 10.6, corresponding to ~350 Myr after the Big Bang. The topic of today’s paper concerns possible ionizing sources during the epoch of reionization, which also happens to be one of the actively-researched questions in astronomy. Quasars and stars in galaxies are the most probable ionizing sources, since they are emitters of the Universe most intense radiation (see this astrobite for how galaxies might ionize the early Universe). This intense radiation falls in the UV and X-ray regimes and can ionize neutral hydrogen (and potentially also neutral helium, which requires twice as much ionizing energy). But, there are problems with this picture. First of all, the ionizing radiation from high-redshift galaxies are found to be insufficient to maintain the Universe’s immense bath of hydrogen in ionized state. To make up for this, the fraction of ionizing photons that escape the galaxies (and contribute to reionization) — known as the escape fraction — has to be higher than what we see observationally. 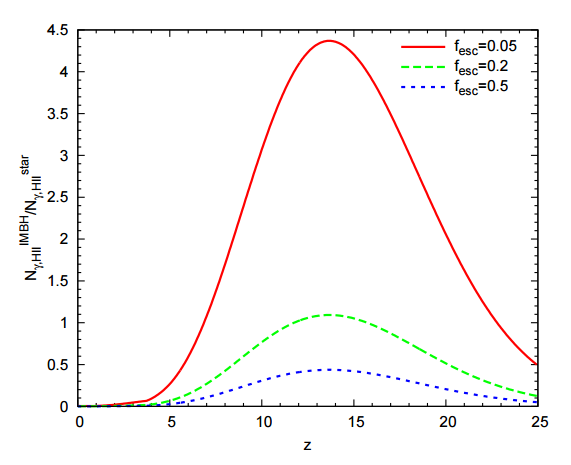 Second of all, we believe that the contribution of quasars to the ionizing radiation becomes less important at higher and higher redshifts and is negligible at z >~ 6. So, we have a conundrum here. If we can’t solve the problem of reionization with quasars and galaxies, we need other ionizing sources. The paper today investigates one particular ionizing source: mini-quasars. What are mini-quasars? Before that, what do I mean when I say quasars? Quasars in the normal sense of the word usually refer to the central accreting engines of supermassive black holes (~109 Msun) where powerful radiation escapes in the form of a jet. A mini-quasar is the dwarf version of a quasar. More quantitatively, it is the central engine of an intermediate-mass black hole (IMBH) that has a mass of ~ 102 – 105 Msun. Previous studies hinted at the role of mini-quasars toward the reionization of hydrogen; the authors in this paper went an extra mile and studied the combined impact of mini-quasars and stars not only on the reionization of hydrogen, but also on the reionization of helium. 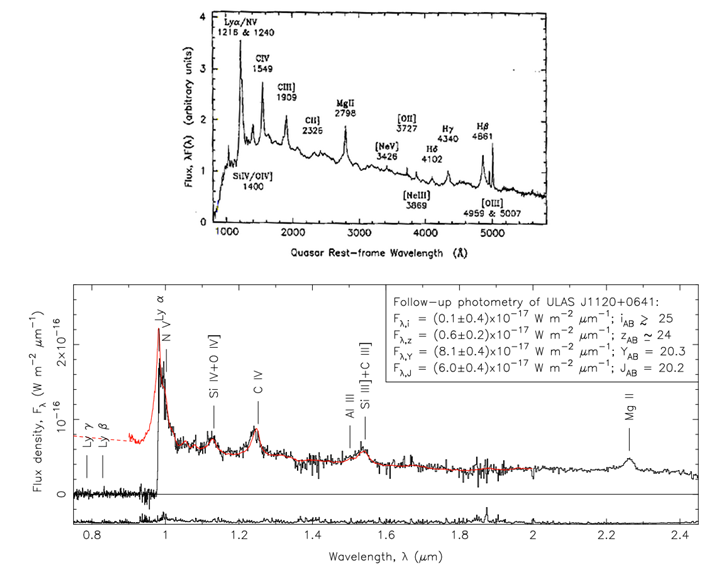 Looking into the reionization of helium allows us to investigate the properties of mini-quasars. Much like solving a set of simultaneous equations, getting the correct answer to the problem of hydrogen reionization requires that we also simultaneously constrain the reionization of helium. The authors calculated the number of ionizing photons from mini-quasars and stars analytically. They considered only the most optimistic case for mini-quasars where all ionizing photons contribute to reionization, i.e. the escape fraction fesc, BH = 1. Since the escape fraction of ionizing photons from stars is still poorly constrained, three escape fractions fesc are considered. 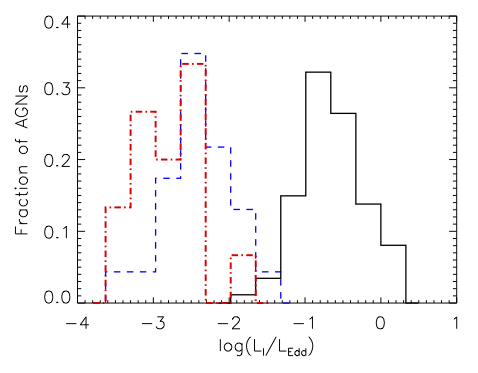 Figure 2 shows the relative contributions of mini-quasars and stars in churning out hydrogen ionizing photons as a function of redshifts for different escape fractions from stars. As long as fesc is small enough, mini-quasars are able to produce more hydrogen ionizing photons than stars. Figure 3 shows the contributions of mini-quasars and mini-quasars plus (normal) quasars toward reionization of hydrogen and helium. Mini-quasars alone are found to contribute non-negligibly (~ 20%) toward hydrogen reionization at z ~ 6, while contribution from quasars starts to become more important at low redshifts . The combined contribution from mini-quasars and quasars is observationally consistent with when helium reionization ended. 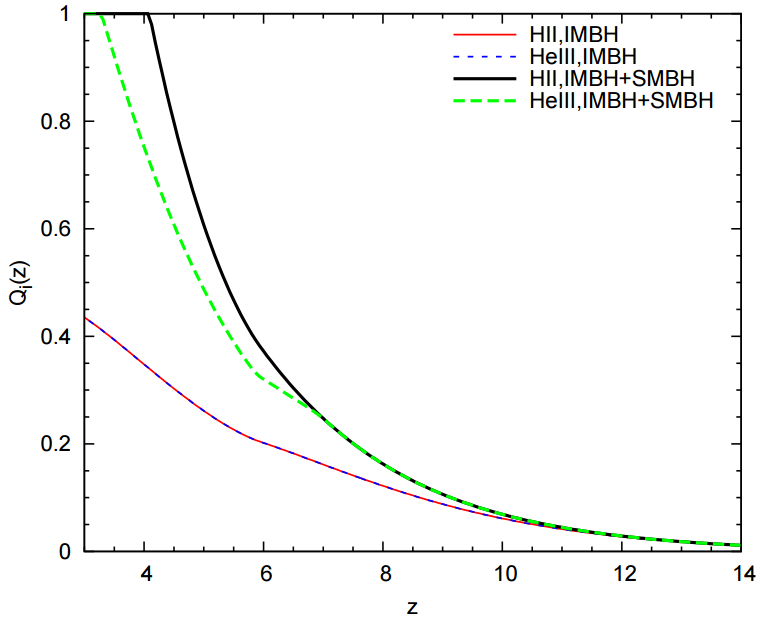 Figure 4 shows the combined contribution of mini-quasars and stars to hydrogen and helium reionization. 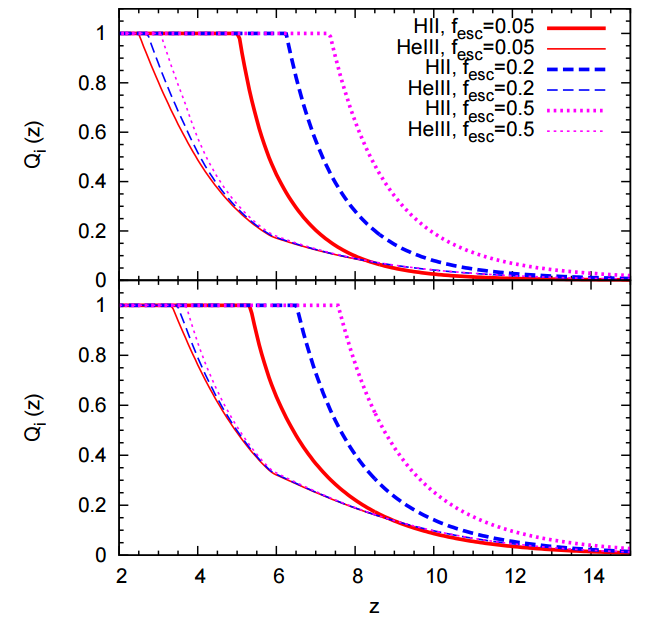 The escape fraction of ionizing photons from stars significantly affects hydrogen and helium reionizations, ie they influence whether hydrogen and helium reionizations end earlier or later than current theory. The authors caution against a couple of caveats in their paper. Although they demonstrate that contribution from mini-quasars is not negligible, this is only for the most optimistic case where all photons from the mini-quasars contribute to reionization. The authors also did not address the important issue of feedback from accretion onto IMBHs, which regulates BHs growth and consequently determines how common mini-quasars are. The escape fractions from stars also need to be better constrained in order to place a tighter limit on the joint contribution of mini-quasars and stars to reionization. Improved measurements of helium reionization would also help in constraining the properties of mini-quasars. Phew….sounds like we still have a lot of work to do. This paper presents some interesting results, but we are definitely still treading on muddy grounds and the business of cosmic reionization is not any less tricky than we hope.